I've been teaching since 2001. I've been an Registered Yoga Teacher (RYT) since 2004 and as of 2007, I've completed the requirements to be an Experienced - Registered Yoga Teacher (E-RYT) (2 years at RYT, plus over 1000 hours teaching yoga) through Yoga Alliance. This will enable me to teach others how to teach yoga or provide continuing education. Here are some of my favorite Yoga Links on the web. Enjoy. Yoga Girl Blog - Mantra of Fact! 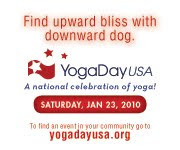 yoga instructor in the Nederland, Texas Yoga Instructors community on YogaCabana.com. EverythingYoga.com - Your source for yoga products, yoga clothing, yoga mats and more!